“If you’re doing a Web survey, you’re doing a mobile survey,” according to Michael Link, chief methodologist for Nielsen, recent American Association for Public Opinion Research president and a leading authority on mobile surveys.1 Indeed, in Pew Research Center’s American Trends Panel, a nationally representative, probability-based panel designed to be primarily Web-based, fully 27% of respondents completed their most recent survey on a smartphone (another 8% used a tablet to do so). Luckily there are things researchers can do to make surveys more smartphone-compatible. The following are eight tips for creating better surveys for completion on a smartphone. Mobile optimization means the software automatically detects the device used, specifically the screen size, and adjusts the layout of the survey accordingly. The font and spacing are larger, as are any buttons that need to be pressed, so that respondents don’t need to pinch to zoom. Additionally, there is no horizontal scrolling, but there may be vertical scrolling. This refers to both the number of questions and the questions themselves. The longer the survey is, the more likely it is to lose respondents – true for any survey, but especially true for surveys taken on a mobile device. And because smartphone screens are small, shorter questions and response options make it easier for smartphone respondents to read and answer questions, which should improve data quality. It’s tempting to include features such as sliders and spin wheels in surveys. However, research has shown that these kinds of features are difficult for mobile respondents to use correctly because they require a high degree of dexterity.5 They also may require more time for respondents to use than simpler formats. It’s best to stick to radio buttons, checkboxes or text boxes, if possible. There is only so much real estate on a smartphone screen, and it is precious. Avoid cluttering up the screen with logos or graphics (they take longer to load anyway). Additionally, position navigation buttons at the bottom of the screen so that respondents are forced to scroll past all questions and response options; that way nothing is missed. Don’t require respondents to enter an access code, username and/or password to access a survey. Doing so creates one more barrier to completing the survey. This is especially true for smartphone respondents, as these requirements mean respondents will have to switch back and forth between the survey’s invitation email and the mobile Web browser. For an easier user experience, create unique URLs for each respondent so that when they click the link in their invitation, they are automatically taken directly to their survey and can begin immediately. As long as you have explicit consent to send text messages to respondents, consider sending survey invitations via text message in addition to email. 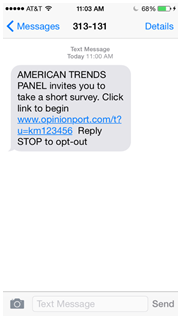 Include the survey URL in the text message so respondents can click directly to the survey instead of having to wait for them to check their email.